Just looking for some clarification on a specific US Army rank insignia for the War of 1812. At the time, I know that the ranks for NCOs were a combination of epaulette placement, sashes and swords. For the US Sergeant, I know they are distinguished by having two epaulettes, a sash and a sword. What I am wondering though, is how (if any) they denoted the rank of Sergeant Major and more senior NCO ranks. I know in the Perrenot book, he describes the rank insignia for the aforementioned ranks was giving a silver/gold crescent at the edge of the epaulette to denote this rank. Is this correct? or is this one of the inaccuracies found within the book? The Perrenot book is the only time I have ever seen the gold crescent mentioned. Without knowing Mr. Perrenot’s source it is hard to judge, but it is on a page showing corporals wearing green epaulets until 1821 (they became button colored in 1780) it is easier to dismiss. 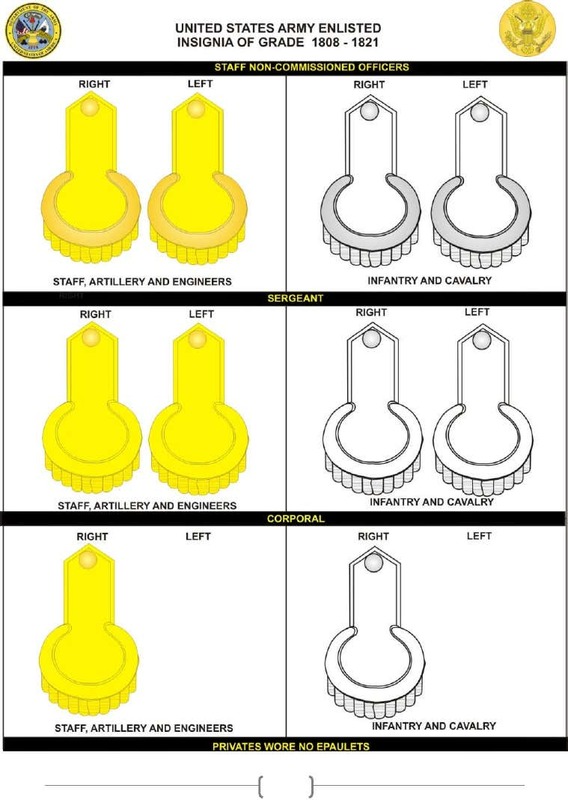 It had been accepted that the army’s NCO epaulets consisted of one on the right shoulder (red for sergeants and green for corporals) form 1775 unitl 1780, then one on each shoulder for sergeants and one on the right for corporals, in button color, white for infantry and yellow for artillery (dragoons wore blue for a time then it was unclear). It was assumed that staff NCOs wore sergeant’s uniforms. Orders did prescribe epaulets for specialists such as farriers, but didn’t describe them beyond that. However the in second edition of Chevrons, Colonel Emerson includes information on a more complex system. He states that as of 1794 farriers, saddlers and artiifcers wore two blue epaulets. His source is a book called March to Massacre by William Guthman. When the army was being enlarged in 1799 for the war with France, Colonel Emerson says that the system was changed to red epaulets for all branches with sergeants major and quartermaster sergeants wearing two, sergeants one on the right and corporals one on the left. The epaulets were changed to yellow in 1800. His source is an article by Mendel Peterson in the Military Collector and Historian from March 1951. A table in the book (one of Colonel Emerson’s strengths at relaying information) expands on the text. It says that sergeants major and quartermaster sergeants wore a pair of white epaulets (for infantry, otherwise it doesn't say) on both shoulders beginning in 1783, a pair of silk epaulets in silver beginning in 1787, a pair of red epaulets beginning in 1799 and just a pair of epaulets beginning in 1812. Drum majors were wearing two silver and silk epaulets as of 1787. Chief musicians are shown as wearing two blue silk epaulets in 1783, two white worsted in 1799, two blue worsted in 1800 and just a pair of epaulets in 1812. Sergeants are shown wearing one red epaulet on the right in 1775, two button colored silk epaulets in 1779, button colored worsted epaulets in 1782 and 1787, one red epaulet on the right in 1799, changed to yellow in 1800 and back to two in 1812. Corporals followed sergeants with a green capulet in 1775, a button colored worsted epaulet on the right in 1779, a red epaulet on the left in 1799, changed to yellow in 1800, then back to a epaulet on the right in 1812. I know that Higher Ranks (From Major to Colonel) used the same insignia of two epaulettes, so I'm guessing it would be safe to assume the same happened for Sergeant Majors and whatnot? That is probably the safest way to think of it.